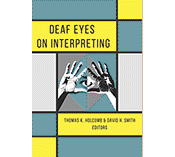 This is the tenth installment featuring highlights from the 20 chapters in the new book, Deaf Eyes on Interpreting, edited by Thomas K. Holcomb and David H. Smith, which was recently released by Gallaudet University Press. 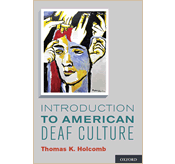 Shifting the focus from the experiences of Deaf college students to Deaf professors, co-authors Dave Smith and Paul Ogden provide a close look at the expectations college faculty members have for their interpreters in order for them to successfully navigate the academic environment. In this video clip, Dave Smith mentions several requirements for interpreting for Deaf professors in this environment where the focus is on supporting Deaf faculty members. 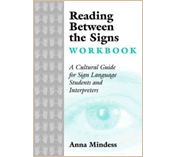 Interpreters must possess an understanding of the wider context of higher education, including the specifics of the tenure and promotion process, the importance of collegiality, the critical need for appropriate register in voice interpretations, a feeling of trust between the professor and interpreter and even the vital role of the interpreter in picking up and relaying incidental information and office politics. 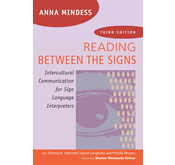 Posted in Deaf academics, Deaf Eyes on Interpreting, Deaf Professionals, information sharing, interpreters, New book, New book, Deaf Eyes on Interpreting, videos from book contributors and tagged american sign language, David H. Smith, Deaf academics, Deaf Eyes on Interpreting, interpreters, Paul Ogden. Bookmark the permalink.